ABC News(NEW YORK) -- A powerful storm that triggered nearly 150 reports of severe weather, including five tornadoes, Thursday has finally ended. The top reported snowfall from the storm was more than 18 inches in South Dakota, with the top wind speed reported at 103 mph in Pine Springs, Texas. The combination of rapid snow melt, warmer temperatures and rainfall caused significant flooding from Nebraska to Wisconsin on Thursday. Record flooding is occurring on the Platte River near Leshara and on the Missouri River nears Plattsmouth -- both near Omaha, Nebraska. Downstream, the Missouri River is expected to rise through the weekend with major flooding heading for St. Joseph, Missouri, and Athcison, Kansas, by early next week. Record or near-record river flooding, exacerbated by ice jams and melting snow, is forecast to continue over the weekend and into next week throughout the region. 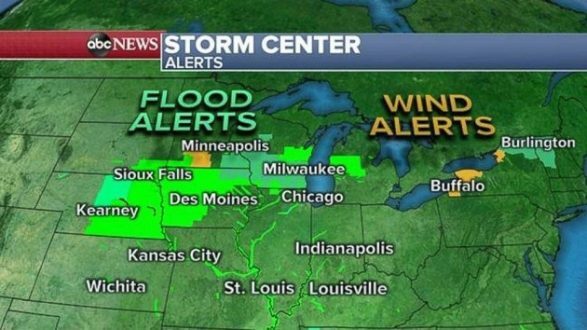 River flooding has been reported near Green Bay, Wisconsin, and multiple flood alerts have been issued Friday morning in the Midwest. The center of the storm that brought a crippling blizzard to the Plains and powerful winds throughout the central U.S. is racing into northern Canada, where radar and satellite systems show it's losing much of its power. All that's left Friday morning are a few scattered thunderstorms along the eastern U.S. and a cold front approaching the East Coast. Ahead of the cold front, East Coast temperatures on Friday will be 10 to 20 degrees warmer than normal -- into the 70s and 80s from the Carolinas to Georgia and into the 60s from Washington to Boston. When the cold front arrives on the East Coast later Friday, a few thunderstorms may develop, but none are expected to be serious. A few comparatively stronger storms, with gusty winds, could develop in Virginia or the Carolinas. Much cooler weather will trail the cold front along the East Coast. Throughout the U.S., following a few weeks of significant weather events, the weather should quiet down significantly. Outside of potential flooding in the Midwest, high-impact weather isn't expected at least for a few days.